The trickster figure seems to be in every culture’s mythology, folklore, or fairy tales. He (for it is frequently a male figure, though female tricksters do show up from time to time) is one of the archetypes frequently exploited in popular studies of anthropology, psychology, literature, and any number of other humanity-based academic pursuits. He’s often popular and a sort of anti-hero, though there are many stories where he can be more sinister or dangerous. He’s frequently an animal, though a highly anthropomorphized one. Rather than trying to examine and interpret this figure as an archetype, which I think has been done to death in other arenas (including here recently), I thought I’d spend today simply presenting a few of the tricksters found in American lore just as they are. They all have their own unique brand of tricksy behavior, and they all have distinct personalities despite being part of a larger archetype. I’m taking a bit of a cue from Judika Illes here, too (particularly her Encyc. of Mystics, Saints, & Sages and her Encyc. of Spirits), offering you a bit of their lore along with some ideas how you could make offerings, encounter them, or work with them in general—all of which I’m basing on stories about them rather than correspondence tables or the like. Also, I should note that this list is far from comprehensive, and merely represents an entry point for a broad field of study (and enjoyment). I hope it’s useful to you! The African spider-trickster, Anansi, has proven to be an enduring and popular (if not universally known) figure in folklore. He is sometimes very clever and wise, sometimes very foolish and easy to subvert. Sometimes he almost seems diabolical, and often he’s rather funny. He figures in folktales from West Africa, the Caribbean, and even the sea islands off of the Georgia coast (where he’s known as “Aunt Nancy”). I talked a bit about him in the last post on trickster-figures, and he is frequently both the fooler and the fool in the same tale. Several of the stories collected from Surinam show Anansi as having a strange relationship with Dog. In one tale, Anansi loans a pair of pants to the Dog so he can attend a dance, but when the dog tries to dance, he nearly rips the pants and Anansi swipes them back (leaving the dog naked to this day). In another tale, Anansi cannot figure out how the Dog can eat so much until a cat comes and the Dog bares his teeth, showing how big his mouth is. In both of these tales, Anansi is less tricking than curious (Courlander 210-11). When he wants something, he tends to get it, though he frequently regrets the price he has to pay to do so. Where to Find Him: Spiderwebs, vegetable gardens, and anyplace there’s an abundance of food. He also sems to like parties. Suggested Offerings: Yams and other tubers, rum, animal parts, fine clothing. Works Well For: Anything where you need to “catch” someone, such as a thief or a gossip. Also outwitting or tricking others into doing your bidding. This tricky figure from Haitian folklore has a lot in common with both Anansi and with the African rabbit character. His name literally means “Uncle Michief,” and his delight is in practical jokes, especially ones that benefit him or his stomach. Harold Courlander says this about him: “Probably the most popular of the charcters [in Haitian folklore] are Uncle Bouki and his perpetual antagonist, Ti Malice. Bouki is ineffective, boastful, sometimes greedy, continually hungry, foolish, and often gently touching. Ti Malice is quick, conniving, and ready to deceive either for an advantage or a joke. Together, Uncle Bouki and Ti Malice form a combination for plot and counterplot, usually funny, sometimes with amoral humor. Existing evidence suggests that Bouki evolved out of an original animal character…Like Uncle Bouki, Ti Malice may also have developed form an animal character. 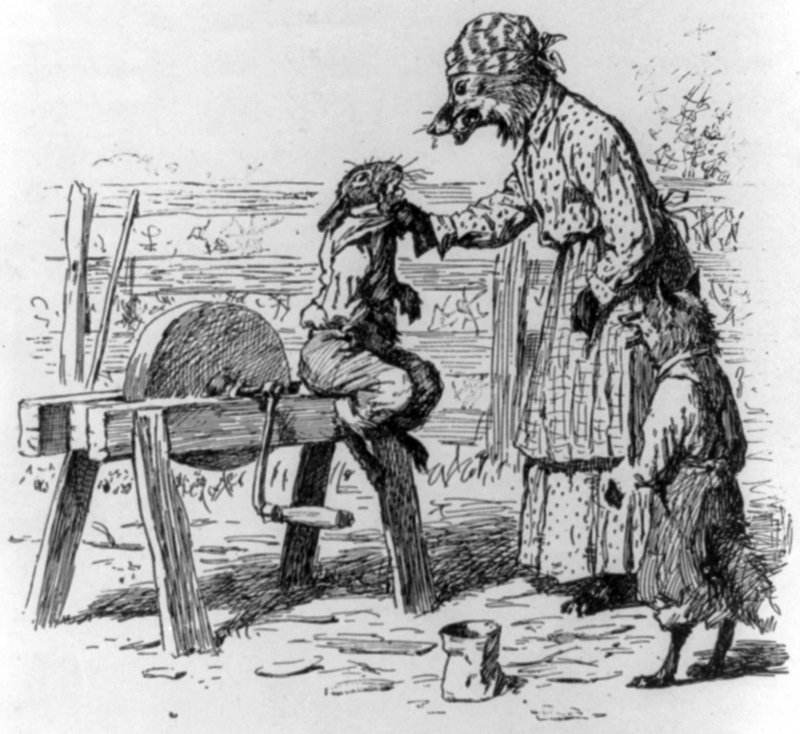 According to the Haitian scholar Jean Price-Mars, some country people refer occasionally to Ti Malice as lapin, the rabbit. Both Bouki and Ti Malice play roles in tales that in West Africa had only animal participants” (60). In fact, there’s a proverb in Haitian Creole which goes “Bouki fait gombo, Lapin mange li” or “Bouki makes the gumbo, but Rabbit eats it” (565) – meaning someone is taking advantage of another’s hard work. In “Bouki and Ti Malice Go Fishing,” Ti Malice convinces his counterpart to give up his share of fish every day until Bouki catches on. A chase ensues, ending with Bouki accidentally helping to free Ti Malice once he has him trapped. In “Baptizing the Babies,’ Ti Malice tricks Bouki into clearing his fields for him while Ti Malice sits in the shade drinking all of their refreshments (he does so by claiming to hear people calling him to come be godfather to their babies, which Bouki believes). Where to Find Him: Haiti would be a good starting place, but you can also find him anyplace that has food he can lay hands on, and he would be at home in bars and saloons, too. I’d also venture to say that some stories show him as lazy and a bit of a squatter, so abandoned shacks and houses might be good, too. Suggested Offerings: Food, and lots of it. He would also take rum, fish, and anything he might be able to use in a practical joke (like a whoopee coushin or joy buzzer, for instance). Works Well For: Getting others to do work for you, gaining quick luck or prosperity, and practical joking. The tricky and cunning rabbit of Southern African-American folklore seems to be an outgrowth or evolution of the Bouki character brought over from Africa (or possibly a derivation of Anansi). He is probably most widely known for his appearances in Joel Chandler Harris’s Uncle Remus tales, and the later adaptation of those stories by Disney in the (sadly unavailable) Song of the South. Many folks know about the “Tar Baby” story, in which Brer Rabbit (Brer being a contraction of “Brother,” by the way) is himself tricked by Brer Bear and Brer Fox into sticking himself to a little doll made of black tar, which allows them to capture him. Brer Rabbit thinks quickly and convinces his captors the worst fate he could face is being thrown into the thorny briar patch (which is, of course, a very natural home for a rabbit). Brer Rabbit uses his wits well—to the point that he is frequently called lazy because he is able to avoid work due to his clever nature. In another story, he avoids clearing a patch of land with his companions and becomes stuck in a well, only to convince Brer Fox that he intends to be stuck in the well because it is so comfortable. He gets Brer Fox to switch places with him and manages to avoid clearing the land, a double-victory for the sharp-witted rabbit. Where to Find Him: The briar patch, of course! Also in any place frequented by rabbits: hedgerows, meadows, etc. Works Well For: Getting out of trouble, and also for general good luck with things like gambling or money. In Aztec mythology, Huehuecoyotl is a coyote with human hands and feet who serves as a trickster spirit. His name in Nahuatl means “very old coyote” and legends about the clever, world-wise coyote permeate the cultures which have derived from Aztec roots. 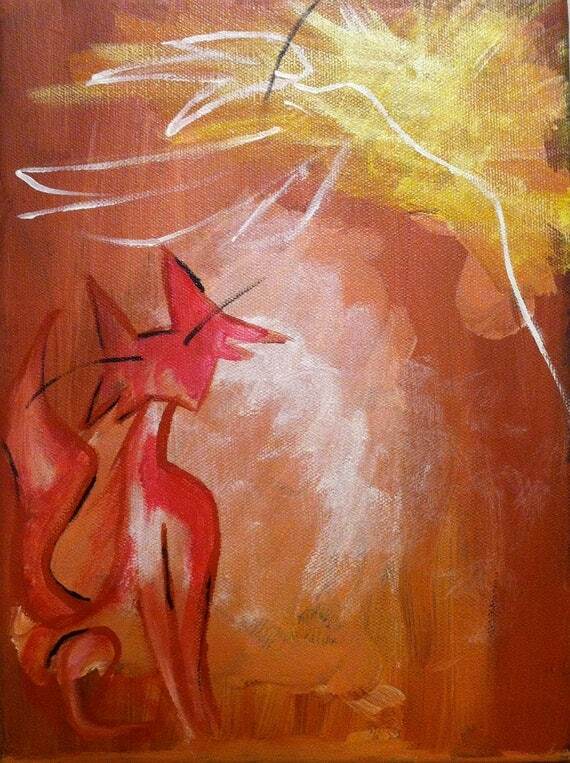 The coyote appears as a trickster in a number of legends throughout the American Southwest and Mexico. In some of his guises, he’s a more-fooled-than-fooling type of figure, but he also frequently gets the best of his adversaries. An Apache legend recorded in Jane Yolen’s Favorite Folktales from Around the World tells of Coyote battling a figure of sticky, resinous pitch much the same way Brer Rabbit battles the tar baby. Instead of a briar patch, he manages to avoid being boiled alive by tricking a fox to take his place, thus being both tricked and trickster in the same tale. In a Karuk myth, Coyote also has the powers of a shapeshifter, willing himself into the shape of driftwood in order to convince several young women to ‘play’ a game with him. The next morning the girls, of course, find that they are all pregnant (see Myths, Legends, & Folktales of America by Leeming & Page for the full story). Where to Find Him: One recurring theme in many Coyote tales is that he frequents places with water—rivers, lakes, etc., so those are good places to look for him. Anyplace you might find real coyotes (such as Southwestern deserts or waste areas of rural land) would be likely spots as well. I’d also suggest crossroads as a decent place to look. Suggested Offerings: A big bowl of food is a great offering, as he seems to be very hungry. Dog food might make sense, but corn meal (and anything made from it) works great, too. Water is good, and he appreciates good red meat, too. Works Well For: Fooling enemies, acting as a guide for spiritual seekers, and warning of impending danger. There are certainly strong European precedents to acknowledging corvids as either tricksters or easily tricked creatures. Aesop records several fables which feature crows prominently in either of these roles (think “The Fox & the Crow” and “Crow & Pitcher,” for example). In North American lore, however, crows and ravens appear in Native legends involving everything from creation to rites of passage. A Tsimshian (from the Pacific Northwest) tale of Raven paints him as Prometheus, taking fire from Heaven to light the world for mankind (and himself in the process). He is also a shapeshifter, much like Coyote sometimes is, and turns himself into a leaf in a bucket of water so that he might impregnate a daughter of Heaven (Leeming & Page). Where to Find Him: Anyplace you find corvids, though he often shows up near fresh water as well. Suggested Offerings: Food (as in the aforementioned cheese from Aesop), other refreshments, bones, meat, fire-based offerings. Works Well For: Gaining knowledge and insight, problem-solving. The bandit-masked raccoon is a natural choice for a trickster figure in the wild kingdom. He’s thought of as a thief due to his nocturnal hunting habits (which frequently involve raiding garbage cans) and his natural markings don’t help his case very much. 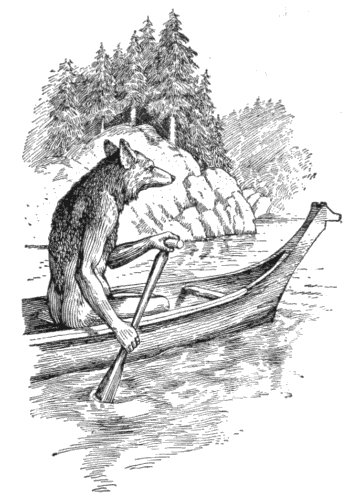 Native American tribes, like the Abenaki and Penobscot, tell tales in which Azeban (as the raccoon is known) either perpetrates wicked jokes or is outwitted by something he does not understand. In raccoon’s stories, he is less threatening than some of the other cunning fellows on this list, leaning more towards mischief than outright mayhem. Where to Find Him: Here I’m going to be a bit literal and say you could probably leave offerings to Raccoon the Trickster by leaving offerings where you might find raccoons in general. Wooded areas, hollow logs, and especially bodies of natural fresh water are good spots to make contact with him. Suggested Offerings; Shiny things, food (especially fish), tobacco. Works Well For: Practical jokes, finding lost objects or treasure, invisibilty, theft. Here’s someone that exists within the pages of recorded history, but whose legends have completely outstripped him and left him in the realm of myth and story. 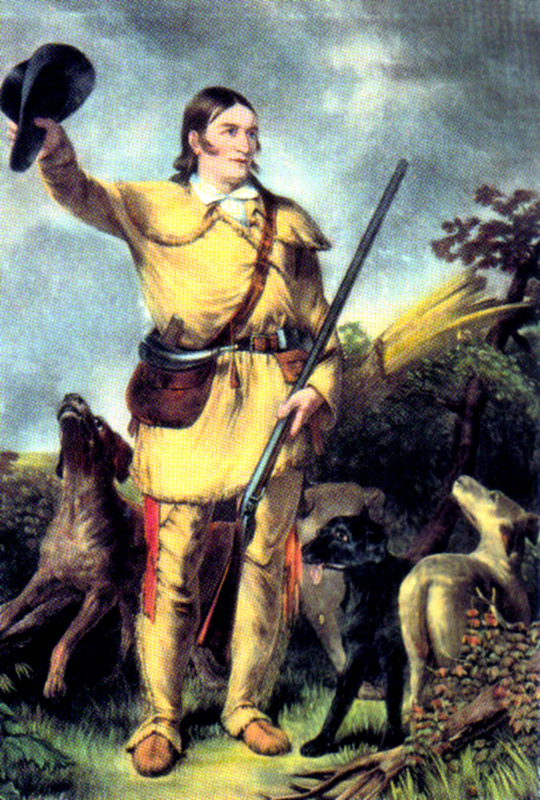 Davy Crockett (1786 – 1836), the famous statesman, frontiersman, and tragic hero of the Alamo, was known for spinning tall tales about himself and presenting a bigger-than-life persona to those around him. Many of the stories about him pit his cunning, rough, backwoods wit against a more polished Washingtonian bureaucracy or performing clever tricks to gain the trust and support of those around him. In one such tale related by S.E. Schlosser, Crockett attempts to gain some votes by buying drinks for his supporters, but finds himself low on funds. He immediately goes out, shoots a raccoon (another trickster), and brings the skin back as payment for the booze. He then surreptitiously steals the skin, and uses it over and over to buy more and more drinks for the swelling crowd eager to support their new drinking buddy in his political campaign. Crockett lived and died a legend, and to some extent, a rather clever trickster. Where to Find Him: In the mountains of East Tennessee (where he grew up), cities like Alamo, TN or Fort Crockett near Houston, and of course, the Alamo. Suggested Offerings: Good Tennessee whiskey, animal skins, equipment like pocket knives or compasses (owing to his frontiersman nature), a recording of his famous song, jokes, or if you’re feeling a bit silly, a coonskin cap. Works Well For: Situations in which bravado and bravery are required, political aspirations, hunting and trapping, putting on an air of success and triumph. Another of the ‘based-in-history’ type of trickster heroes is Stagolee, whose legend as a fierce and amoral figure made him an inspiration to many enslaved African Americans in the nineteenth century. His origins may come from any number of men with names similar to his, such as Stacker Lee of Missouri, who killed a man for trying to steal his hat, which was reportedly imbued with shapeshifting magical powers. He’s certainly a man who doesn’t seem to care who gets hurt, so long as he gets his own way, but his callousness is a very thin mask for the bubbling frustration felt by millions of enslaved people who so desperately wanted the type of freedome Stagolee represented. 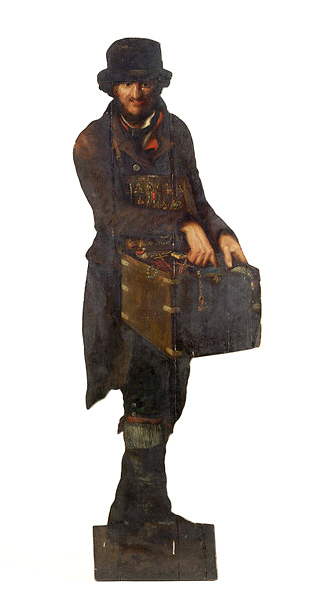 The legends say that Stagolee left the plantation where he was born at an early age, carrying only a guitar on his back (to play blues and seduce women), a deck of cards in one pocket (so he could win money whenever he needed it), and a .44 pistol in the other (in case he didn’t much like someone, or a card game wasn’t going his way) (Leeming & Page). Stagolee veers into the realm of tall tale as well, and most of his tricksy aspects have to do with the hyperbolic ways in which he confronts various people of authority. A sherrif who tried to arrest him once found out the hard way that he was not a man to be messed with. Stagolee hit him with an upper cut, drew his gun, shot the sherrif three times, put his gun away, finished his drink, and walked out the door before the sherrif’s body hit the ground. One of his victims (the one who tried to steal his hat), had a widow whom Stack immediately married following the funeral. I’m not sure if that qualifies as a trick exactly, but it sure seems like some slick work to me. Where to Find Him: First of all, I’m not entirely sure you want to find him, but if you do, he was reputed to have spent much time in Memphis and St. Louis. I imagine another good place to look for him would be dive bars and places with unsavory characters aplenty. A word of caution here—he did not care for white men in his lifetime, and so there’ s no reason to think he’d be much likely to start working with white men now. Connect with him at your own risk. Suggested Offerings: Booze. He had a legendary thirst for whiskey and moonshine, so these are good options. You might also consider leaving him a nice Stetson hat, some bullets and/or gunpowder, or deck of playing cards. Works Well For: Black empowerment, any situation which requires you to overcome authorities, any sort of mercenary magic, getting revenge on enemies, overcoming legal hurdles, and anytime you think you might need a little help in a fight. You know Jack, don’t you? Jack of Jack and the Beanstalk made his ways over to America by way of the British Isles and found a new home in the stories and tall tales of the Appalachian Mountains. Combining a bit of foolishness with a bit more cleverness and a lot of luck, Jack manages to get himself in and out of scrapes varying from the aforementioned beanstalk (or bean tree as it’s sometimes called in the mountains), outwitting the Devil, or rising above the meager poverty in which he almost always begins a story. Frequently, the cunning hero is called upon to perform incredible tasks, and most Jack tales involve him embarking on a quest away from home and eventually meeting a girl whom he marries (frequently a king’s daughter). Jack’s often helped by strange old men on his journeys, as in “Soldier Jack” or “Jack and the North West Wind.” He seems to like being able to provide for his family, especially his oft-suffering mother, and a good meal means a lot to him. Where to Find Him: This is a litte tough, as his location is always changing. Generally speaking, though, roads and pathways are a good place to try and contact him. Suggested Offerings: A big plate of food, especially mountain fare with lots of veggies, biscuits, and other vittles. He’d probably enjoy a nice jar full of mountain dew (aka moonshine) as well. Works Well For: Anything where you need a lot of luck on your side. He’s always coming through by the skin of his teeth, so situations where you need a little push from Lady Luck are his specialty. Likewise travel and journeys have his special blessing, and anything involving pulling a little gold and silver (or your money of choice) into your life could use his help. If you’re a regular reader of this blog, you’ve probably seen me post about John the Conqueror root before. That root is allegedly named after an African American folk hero, a slave who refused to accept subservience and used his tremendous cleverness and skill to perpetually rule his master, although his master never seems to know it. Zora Neale Hurston publicized this character fairly strongly, even giving him his own section of her book The Sanctified Church. She also includes a story about him as the opening tale in her (essential) book Mules and Men. In this story, John must fetch water for his master in the middle of the night, but sees a frog which he thinks is a ghost and flees without collecting the water. John is portrayed as foolish and sycophantic, but in reality he manages to convince his master not to send him out in the middle of the night, thus getting his way in the end. John’s cleverness and power waxes and wanes depending on the tale, sometimes reaching the nearly mythical levels of a John Henry or a Paul Bunyan, but often showing him as more a man of brains than brawn. Where to Find Him: This one’s tough, as many of the tales take place on plantations in the South (which would be a good suggestion, but rather limiting). He periodically takes trips on roads or rivers, though, so I think those might be reasonable as well. Suggested Offerings: A High John root, some whiskey or rum, and money. Works Well For: Outwitting superiors (like bosses), getting your way in an argument, travel and freedom. Our final fellow is a trickster figure who appears in the 19th century and who becomes somewhat ubiquitous in the post-Civil War folklore. He is more of a con artist with a silver tongue than a practical joker, and frequently his buyers and audience know that they stand a good chance of being tricked or played upon by his sharp wit, but the opportunity to trade barbs proves too strong to resist. In a tale from the 1850s, a pedlar and a group of local townsfolk get into an exchange. The pedlar manages to flatter the ladies and outfox the men, who accuse him of selling useless items like “goose yokes” and “wooden nutmegs.” He does not deny the charges, but instead notes how well such things sell in that part of the country and implies that perhaps they would like to keep up with the yokel Joneses by placing an order with him (Leeming & Page, 143). Where to Find Him: Places of commerce and exchange, such as marketplaces. The road (or other commercial travel route). Suggested Offerings: Money (including fake money to play on his tricky side). Knick-knacks and small collectibles. Works Well For: Business-related matters, especially if you want to get the most out of the customers who come to you. Also good for con artists. So that’s my “short” post on some American trickster figures. I hope that if nothing else, they’ll inspire you to look at their stories and learn more about them. They’re all quite interesting and funny, and really open up the field of lateral thinking to a new level.